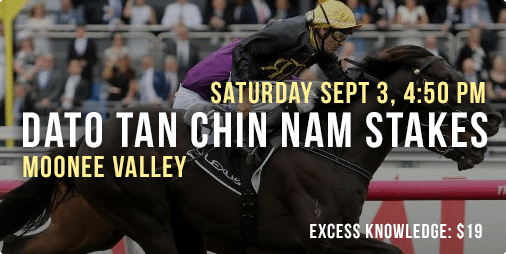 THE Group 2 $250,000 Dato Tan Chin Nam is a quality spring opener which features some of Australia’s best middle distance horses. Moonee Valley hosts a nine-race card which also includes Group 2 McEwen Stakes and the Atlantic Jewel Stakes. We have all the latest odds, form and free tips for all nine races which kicks off at 12.25 with the William Hill R84 Handicap. If your horse finishes second or third in the opening three races at Moonee Valley, Sportsbet will give you $50 cash back in bonus bets. Kaniana was an impressive winner at Caulfield last start and it clearly thrives racing over the mile. The Darren Weir-trained mare won its only start on this track and it should be able to fire around this track. Bookmakers have it as the clear $3.10 favourite. Fellow last start winner Champagne Cocktail has been well backed at $4.80 and looms as a strong chance. The Melissa Wells-trained mare capped off solid form with a narrow win at Pakenham and it drops right down in weight to 54kg for this. Looks a strong contender to overthrow the favourite. Former Kiwi runner Choice hasn’t exactly impressed punters in its two Australian starts, but more is expected of it now. The Nigel Blackiston-trained mare finished third in a group race in New Zealand and it has a fair amount of ability, but it will be looking for a rain-affected track. Conditions could suit on the day with rain forecast. Master Zephyr finished off stylishly behind Royal Rapture last start and it usually improves with the run under its belt. The Weir-trained gelding goes best on this track with four starts for two wins and two placings. It has drawn well in barrier two which is ideal around the Valley and Craig Williams riding at 54kg is a luxury. $5 on offer from bookmakers. Also at a nice weight is current $2 favourite Raw Impulse. The Weir-trained stayer is fresh up after running fourth in the McKell Cup over 2400m and although the mile will be short of its best, it did win over 1500m on this track last campaign. Drawing the inside barrier with ensure a soft run and we’re expecting many multi-bets to run through Raw Impulse. Mihany is an inconsistent type which has the ability to win, but looms mostly as a place chance at $1.85. The $6 win price is too short for the gelding which faced a similar field at Flemington two starts back and finished ninth. Drops in weight to 52.5kg which does bring appeal. Hey Doc kept its unbeaten fresh up form in tact with a last start win at Sandown. The Tony McEvoy-trained three-year-old has produced only one bad run which came in the Blue Diamond behind Extreme Choice and its form elsewhere has been solid. It looks a strong chance at $7 in what is a very even betting field. Last start winner Rocketeer was an impressive four-length winner at Wangaratta and it’s the equal favourite at $7. The Mick Price-trained gelding was the $1.45 favourite last start and it did the job well, suggesting it could make the step up in class. Mick Dee takes its weight down to 53.5kg and it’s dangerous at the weights. Ontoff Ofthe World was a narrow last start winner at Echuca and it has shown enough to be considered at this level. Trained by Luke Oliver, the three-year-old relished the heavy conditions last start and the track should be rain-affected again. $8 with bookmakers suggests it could win again. Mr Individual is a four-time winner which pushed Prince Of Brooklyn close last start. The four-year-old looked the winner, but was caught late and the same tactics should work more effectively around Moonee Valley. It is having its first start around this track which is concerning, but the $4.60 suggests it should run well. Forget the run of Vostok on Sundat Cranbourne as the Henry Dwyer-trained gelding had no luck in the run. The four-year-old ran as the $2.35 favourite, but jockey Daniel Stackhouse couldn’t find room in the straight and it went hard-held to the line. Senior rider Damien Oliver takes over the duties now which is a positive and it looks a strong chance at $3.80. Last start winner Moss ‘n’ Dale was an impressive 1.75-length winner last start and it looks to be on the improve. The four-year-old has now won four from eight and its best form comes on rain-affected tracks. Regan Bayliss takes its weight down to 56.5kg and it looks a strong chance at $3.80. Furnaces is fresh up following its fifth in the Ortensia Stakes at Scone and it rarely goes a bad race fresh. The John O’Shea-trained horse won its start prior at Hawkesbury and it ran third in this race last year when 2.75 lengths behind star sprinter Chautauqua. Chance here at $5.50 after opening at $6.50. Heatherly showed its class when winning at Moonee Valley last start and although it has drawn wide in barrier 10, it looms as a major chance here. The daughter of Lonhro made it four wins from its last five starts and it has now won three times on this track. It will need to jump quickly from the wide barrier, but the $2.80 looks about right from the bookmakers. Sheidel is a professional winner of 12 races from 20 starts and two of those have come fresh up. The Hayes/Dabernig-trained mare is also a six-time winner at this distance and after finishing seventh in the Group 1 Goodwood Handicap last start, it looks well placed in this grade. Win hope at $5.50. I Am A Star has rattled off three consecutive victories and has looked impressive in doing so. The Shane Nicols-trained filly has drawn very wide in barrier 16 which will make winning tough, but it settled back last start and flew home late. Similar tactics will be used here and it only needs some early luck to show up at $7. Piccadillies has been hammered in the betting. The Freedman-trained filly opened at $10 and that price has been slashed to $5.50. It won a trial last year so has been patiently handled and the amount of tote support suggests a big run is expected on debut. Follow the market and any further positive betting moves. Tan Tat Beauty was a nice winner on debut at Pakenham and it nearly scored again last start. The Henry Dwyer-trained filly put in a late dive on this track last start, but missed by a nose and the inside draw will be a big assist here. It opened at $13 in the betting and has since firmed into $11, so it looks a strong each way chance. Fast ‘n’ Rocking has been disappointing for punters this campaign, but it continues to run solid races. The Hayes/Dabernig-trained gelding has class at its best and it has won and placed on this track, but it will need some luck from out wide. It opened at $5.50 and has since firmed into $5. Voodoo Lad scored an impressive win last start at Caulfield by 2.25 lengths. The Darren Weir-trained sprinter won its only start at Moonee Valley when it was able to lead from barrier five and a similar outcome is likely for this run. It has good flat speed and the weight of 55kg plays right into its favour. Strong winning chance again at $3 after opening at $2.80. Keen Array will likely race on the speed and it should be ready to go having not raced since March. The four-year-old hasn’t missed the money in two starts at this track and it goes best at this distance. It drops right down in weight to 54.5kg with Dwayne Dunn in the saddle and it looks a strong chance at $5. Former Japanese horse Tosen Stardom is fresh up after three disappointing runs in Japan, but it is twice a winner fresh up and Darren Weir would have worked wonders on it. The six-year-old has been well supported at $5.50 and has remained the favourite throughout the betting. That price is too short for our liking, but it’s an each way chance. Excess Knowledge has firmed into $19 and looked good in a recent trial when second. The Waterhouse/Bott-trained horse has had seven starts fresh up for two wins and three placings. It is twice a winner at the distance and although it’s starting this campaign to prepare for the staying races, it could surprise at big odds here. Strong each way hope. Jameka finished off well last time out when fourth at Caulfield in the P.B. Lawrence Stakes. The Ciaron Maher-trained mare should be in for a good campaign and with that run under its belt, it could fire in this. It handles all track conditions and despite drifting in the market, it’s a nice chance at $7.50. Killarney Kid has won back-to-back races and in good fashion. The Weir-trained gelding is now a seven-time winner at this distance and although it rises up in weight, it looks a strong chance once again. Bookmakers are keeping it safe at $5.50 so consider here. The current favourite is O’lonera which has recorded three consecutive wins. The Cindy Alderson-trained gelding has been winning comfortably at Caulfield and it placed in its only run around Moonee Valley. Dropping down to 54kg will only help its cause and it has been backed into $4.60 after opening at $5. Tall Ship has been disappointing in three runs this campaign, but more is expected now with those runs under its belt. The Werribee Cup winner is at big odds to cause the upset here, but it gets 1.5kg off its back and it could run a cheeky race at $21. Previous PostCan The Cleaner win a third consecutive Dato Tan Chin Nam Stakes?